Starbucks launched their Refreshers drinks two summers ago. Laced with green coffee extract, the drinks are supposed to give you a mild energy boost as well as provide a cool, lightly sweetened drink – which makes them refreshing in two ways. I have been a big fan of them since they first came out because I definitely find them to be refreshing on a hot day because they aren’t too sweet but have a nice flavor. This Homemade Cool Lime Refresher is an easy to make version of Starbucks’ Cool Lime Refresher that you can easily make at home. It is a lot like limemade, but with a lot less lime juice and sugar so it has a milder (and, yes, more refreshing) flavor. You need to use fresh lime juice to get the best results, but one lime will allow you to make one or two large drinks, so a little goes a long way in this recipe. It can also be doubled or tripled if you want to serve a crowd. My homemade drink doesn’t contain any green coffee bean extract, but if you want to add some to yours, you can track it down at many health food stores in the nutritional supplement aisle. Personally, I just have a little regular coffee to pick me up and then the refresher to cool me down. 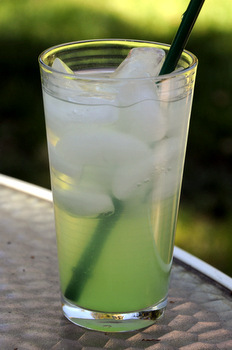 In a large glass (16-oz) combine lime juice and sugar. Stir well until sugar is dissolved in the lime juice. Fill the glass about 2/3 full of ice, then top with water. Use a long-handled spoon or straw to give the drink a gentle stir before serving.